Fans are always looking for ways to breathe their chosen object of obsession to life, be it dressing in the garb of a jawa, or learning to speak Klingon. But one dimension that often gets overlooked in making the fantastical real is smell. Imagine how much easier it would be to LARP (“live action role play”) your way through the dead marshes with a whiff of sulphurous mud, or to gather information from the local bar-keep with the thick smell of dwarven ale wafting through the air. 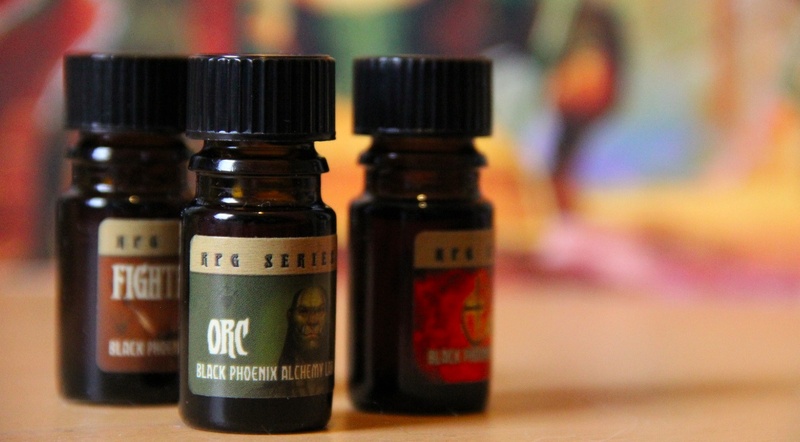 Cult perfumers Black Phoenix Alchemy Lab have crafted a set of RPG themed fragrances help summon the world of Gary Gygax and Dave Arneson into our own. It is possible for you to smell like Grishnak or Radbug, like a dirty, filthy orc who has never heard of a bath or a washing machine. Intrigued, I decided to try out a 5ml bottled of BPAL’s Orc on my roommate and boyfriend. Upon first cracking open the bottle, Orc smells dirty, like layers of abattoir sludge that have dried and caked into greasy, acrid hide armor. The listed notes are “grey courgette (as in cucumber), musk, leather and vetiver,” the roots of a grassy plant alleged to smell like smoky trees. “I don’t like it,” Andrea says. Graeme’s reaction is more positive. I dot a small amount of the oil on the inside of my wrists. Once it’s on, Orc loses some of the grime, and the watery, creamy cucumber floats over a punching, liquorice spice. It fades into a sweeter, harness-shop smell, horsey and leathery mixed with anise. While Orc isn’t a conventional smell, it is exactly what you’d want and expect for the scent of a grey-green troll-man. Grassy and oily, Orc’s fresh roots and moldering leaves would enliven a table-top RPG game, bringing the scent of the beast hackle-raising-ly close. If you must wear it on a date, leaven with a drop of flowery Elf oil and get those half-orc pheromones going.